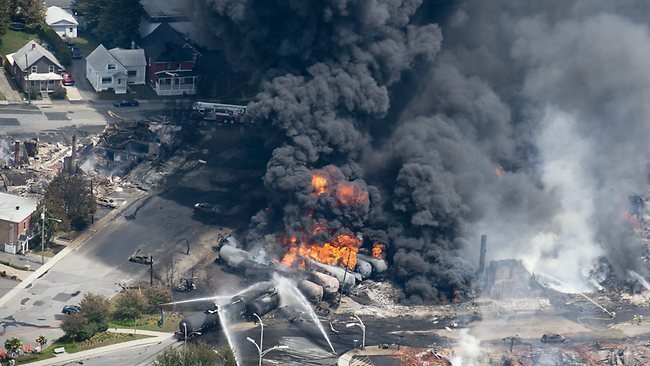 Is anyone as upset as I am about the lack of coverage of the horrific train wreck that occurred Saturday in LAC-MEGANTIC, Quebec Canada and nearly destroyed an entire town? This train was carrying tankers full of crude oil. The conductor parked the train shortly before midnight Friday, according to a report published by Voice of America, and quoted the company as saying it believes the conductor set the brakes properly. But “sometime after, the train got loose” and headed into town “under its own inertia.” (Reuters) – At least five people died and 40 were still missing on Sunday but authorities have not yet been able to search in areas that are still burning or in danger of further explosion from other tankers. 30 buildings were totally destroyed. Up to 2,000 residents – a third of the town – were forced to evacuate their homes. Why should we be concerned? Because everyday hundreds, if not thousands, or trains are passing though American towns and cities carrying all types of dangerous, hazardous cargos. If America knew what was barreling through their neighborhoods, they would be appalled. And derailment happens…more often than you think. On March 27, 2013 a mile-long train hauling oil from Canada derailed and spilled over 30,000 gallons of crude when 14 cars on a 94-car Canadian Pacific train left the tracks about 150 miles north-west of Minneapolis near the town of Parkers Prairie. Although the derailment is the first major spill of the massive expansion of crude shipment by rail, which has rapidly increased over the last three years as North American oil production has outgrown existing pipeline capacity, it will not be the last. Canada is the top exporter of crude to the USA – crude from its vast tar sands deposits. Environmentalist warn about the risks from the growing volumes of this crude mixture that cross our borders via rail with about 40,000 barrels a day on average shipped to the USA in 2012 (Canada’s National Energy Board stats). Many eco-conscious Americans seek to block TransCanada Corp’s controversial Keystone XL project, which would carry oil produced from the oil sands to the U.S. Gulf Coast refining center, and experts argue that oil by rail carries an even greater risk of accidents and spillage than the XL Pipeline presents. Shipments of petroleum on U.S. railroads rose to over 46% last year to 540,000 carloads, according to the Association of American Railroads last January. How frequent are these spills? Here are a few examples, and these are the ones we KNOW about…we have seen how the Oil Industry likes to keep these things quiet. In May of 2010 Trans-Alaska Pipeline spilled thousands of barrels of crude near Ft. Greely. In June 2010, a Chevron pipeline ruptured and spilled oil into a creek near Salt Lake City, Utah where an estimated 33,000 gallons spilled into the creek, which leads into the Great Salt Lake. In July 2010 a pipeline in southwestern Michigan leaked over 800,000 gallons of oil into a creek flowing into the Kalamazoo River. In July 2011, a pipeline beneath Montana’s Yellowstone River ruptured and sent an oil plume 25 miles downstream. Despite claims by Exxon Mobil that the pipeline was safe the spill released over 63,000 gallons of oil and carried an estimated cost of $135 million to clean the river. In March 2012, a group of 66 residents of a Salt Lake City neighborhood sued Chevron for damage caused by the Red Butte Creek spill and another smaller spill in December 2011. 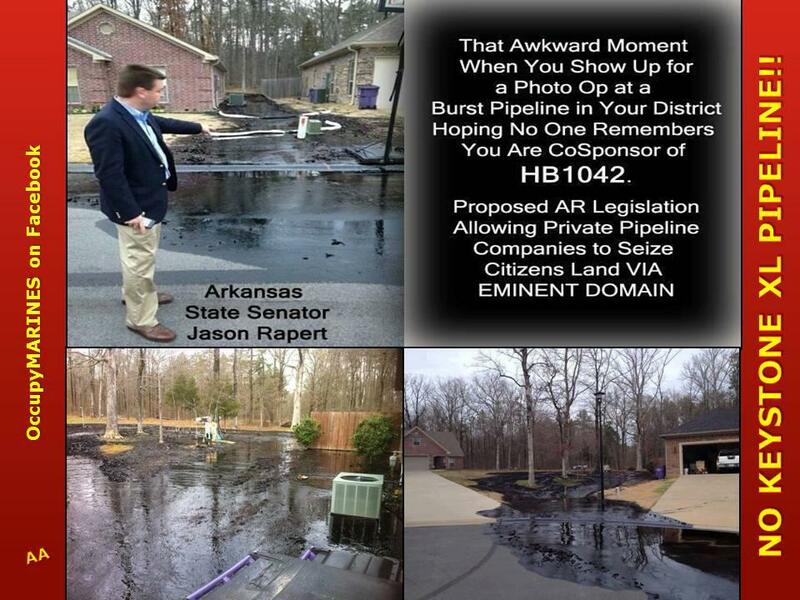 In late March 2013, Exxon Mobil’s Pegasus pipeline ruptured and spilled about 5,000 barrels (210,000 gallons) of Canadian heavy crude oil (tar sands) into a residential area in Mayflower, Arkansas. Exxon removed a damaged 52-foot section of the pipeline. Not long after, local residents began reporting health issues. The company’s cleanup efforts – which included using paper towels – were much criticized in the media. In April 2013, one month later, the same pipeline leaked more oil into a residential yard in Missouri. In January 2013, a barge carrying 668,000 gallons of light crude oil traveling on the Mississippi River crashed into a railroad bridge, damaging an 80,000 gallon tank on the vessel which spilled oil into the Mississippi. Officials had to close the Mississippi River for eight miles in either direction, causing a backup of over 1,000 barges. Workers completed the clean up in early February, but the incident is still under investigation. Over 7,000 gallons of crude are still unaccounted for according to the Coast Guard. It should be noted that this was the second collision of an oil tanker on the Mississippi in the past year. In February 2012 two barges collided, leading to a five-mile wide closure. Bottom line is this stuff is bad for the environment and once spilled can never be fully recovered. And Tar Sands are one of the most environmentally and socially destructive projects on the face of the planet! Tar sands development is the single largest contributor, and fastest growing source of greenhouse gas emissions. Tar sands operations require vast quantities of water, which become contaminated and must be stored in huge tailing ponds. It cannot be cleaned or reused. This not only depletes local water reserves but threatens to pollute the environment and nearby communities. Health concerns related to the tar sands are associated most with air and water pollution. In addition to carbon dioxide and other greenhouse gases, tar sands operations also emit other substances into the atmosphere, most notably nitrogen oxide, sulfur oxide, particulate matter and volatile organic compounds. Why not take the direct route? The XL Pipeline will cross America from Canada to the Gulf if approved. Most of this oil will be exported to China and is not for American use. This might bring one to ask, “Why doesn’t the pipeline take a more direct route across Canada to its western shores?” Why indeed. There are 8 existing refineries in Alberta that could either be expanded or converted to handle the tar sands but Canada won’t do it because they don’t want to pollute their own country.According to Creamer Media, an on-line mining news publication, the newly-minted liberal Canadian government has rejected authorizing a pipeline from Alberta to British Colombia. Apparently it’s OK for the USA to shoulder any potential risks, but the risks are “unacceptable” in Canada. It’s not just petroleum products we need to be concerned about. Train derailment accounts for a small portion of the total number of hazardous materials incidents in the USA however, their consequences are more severe. In a study by the National Transportation Safety Board, in a ten-year period covering January 1992 through January 2002, about 15 to 40 of these accidents occurred in the US every month. Accidents involving train collisions with trucks transporting hazardous materials showed an average of 62 accidents annually – but there may be as many as 750 near-collisions of this type. Total transportation-related accidents involving hazardous materials that have occurred throughout the US from 1987 through 1996 are estimated at over 100,000. The transportation of hazardous materials is an important problem due to its frequency as approximately 1.7 million carloads of Hazardous materials (HazMat) are transported by rail each year. These materials, or dangerous goods, include explosives, gases, flammable liquids and solids, oxidizing substances, poisonous and infectious substances, radioactive materials, corrosive substances, and hazardous wastes and tar sands. Remember that due to the nature of most of these chemicals, they can pose hazards of explosion, toxic release, and fire. And they are barreling though your neighbourhoods daily…or seeping from underground pipelines. Chevron officials did not immediately return calls for comment.